It is widely understood that adopting best practices in sustainability can offer a significant competitive advantage. There is ample incentive to get on board. In 2012, sales of sustainable goods and services reached $1 trillion globally and in 2013, it may double to reach $2 trillion. As early as 2017, the sustainable economy could be worth $10 trillion in annual global revenue. Almost three out of four Americans now believe that climate change is real and they want companies to do something about it. The implementation of best practice campaigns can help companies to respond to consumer demand and capitalize on the rapidly growing sustainability market. You can find sustainable best practices everywhere, from tourism to IT, from building to health care. You can even find it where it seems out of place, as in the mining sector or in the shale gas industry. The words “best practice” are everywhere and they are often used inappropriately. A study on the most overused buzzwords showed that in 2010, “best practice” was used more than 4,600 times in industry press releases. The question is what constitutes authentic best practice when it comes to sustainability? Monitor and manage emissions, set targets for emissions reductions. Reduce impact on indoor air quality. Monitor and reduce energy consumption. Implement energy efficiency programs. Develop energy reduction targets for IT, manufacturing, lighting, heating and cooling. Track the mileage of all company vehicles. Tracking mileage and examining your travel routes can help you better understand your fuel usage and find more expedient routes. Monitor water consumption and develop strategies for water reduction. Effective strategies can start with something as simple as retrofitted faucets with low-flow aerators. Monitor waste and develop a strategy for waste reduction and recycling. Knowing the waste stream makes it easier to identify targets for waste reduction. Keep a log tracking the trash. Include a recycling program with a good plan including logistics that detail how recycled materials will be collected and stored. Most commonly, these issues are addressed with the help of an internally selected group of dedicated sustainability managers representing different departments. This group is commonly referred to as a Green Team. There are two fundamental components which are absolutely essential to almost all sustainable best practice campaigns. They are employee engagement and reporting. There is an art to securing the willing participation of employees. It is important to get employees involved so that they can effectively implement the campaign. The first step to engaging employees in sustainability involves setting targets. For employees to deliver, they must know what is being asked of them. This means developing clear strategic objectives and then crafting actionable plans to achieve those objectives. It is important to provide incentives for participation from the inception. Establish recognition and/or reward programs for employees who contribute to the company’s sustainability initiatives. Publicize the campaign and schedule an inaugural event. Use coordinated communications to promote the program, inspire employees and motivate change. Include internal signage and online communications educating employees about relevant sustainability concerns. Focus on educational efforts that help employees understand how their individual actions can make a positive impact on the organization. Empower people at the local level. Provide opportunities for employees to participate and collaborate. While everyone within an organization needs to get involved, green programs work best if they are voluntary. Be open and transparent about the progress on individual sustainability projects. Develop interactive scorecards and encourage friendly competition between offices and regions. Corporations are more vulnerable than ever to public scrutiny. Responsible conduct and transparent disclosure are the best ways to handle the risks associated with this new reality. Measuring performance is essential both as an internal metric assessing success and as an objective means of communicating with those outside of an organization. It is imperative to develop metrics that track and monitor performance as well as identify and respond to challenges, opportunities and threats. Effective reporting commonly depends on technological tools to collect data and generate reliable metrics. These reports must be able to simultaneously speak to the concerns of employees, suppliers and investors. Engage through storytelling: In addition to facts and figures people want to meet key players and follow the story behind their achievements. Report progress against goals in a multi-year format: Multi-year charts are necessary as are any explanations of missed targets or unusual performance. Push the transparency envelope: Honestly explain your approach and reveal what worked well and what did not. Show how you will learn from your experience and do things better. Follow the Global Reporting Initiative (GRI) standard: This is increasingly the standard for sustainability reporting. However, even small business can consider a “GRI-inspired” report. Sustainability report formats: Supplement paper reports with interactive, web-based content, videos, social media, games, apps and any format that will allow you to convey your message. Developing and implementing a sustainability best practice campaign can be onerous. However, businesses that succeed in engaging employees and providing cogent reporting support their brand, improve morale while developing a productive and collaborative culture. 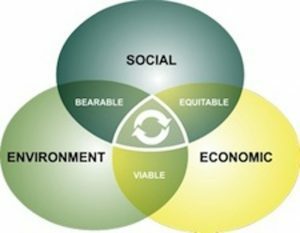 A well executed campaign can offer tremendous benefits that encompass the triple bottom line of people, planet and profits.